The morning was filled with sunshine. As we continued our drive, vast snow covered peaks start breaking the horizon. The ground was brown and rocky. We crested the first of many la (mountain passes). 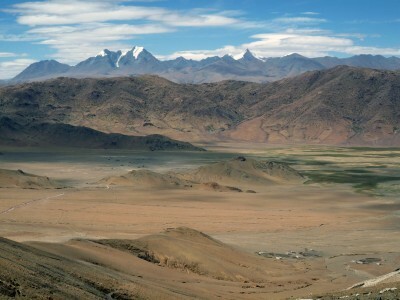 Shishapangma at over 26,000 ft loomed large. A gate of prayer flags welcomed us to the Tibetan Plateau, the rooftop of the world, at nearly 16,000 ft in elevation. 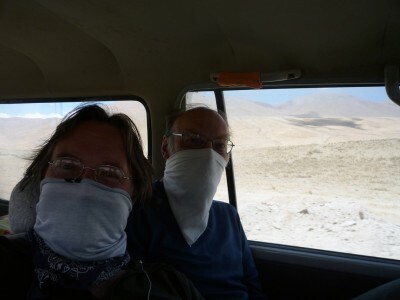 A half hour further, we left the main road which leads to Lhasa and began the dusty, bone-jarring crawl towards Kailash. 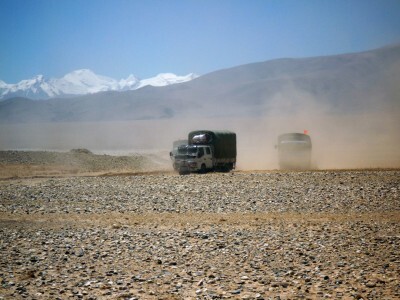 Miles and hours battered us and fine sand in the form of dust floated into the cab of our vehicle. We tied bandannas around our faces to keep the dust from our lungs. 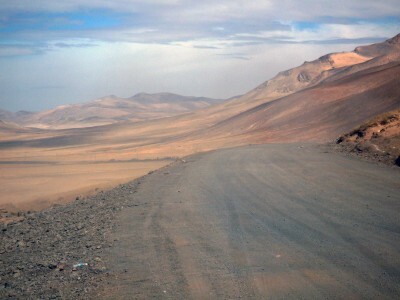 We passed a huge cobalt blue lake whose color bled into a dark purple and brown hill, capped with white clouds. This lake was followed by a second with black waters ringed by ashen alkali. The scenery was dreamlike. After seven hours in the dirt we arrived at the outskirts of the town of Saga near the blue green waters of the Brahmaputra River as it begins its journey to India. Our lodging was a small tea house with basic hard beds and a communal eating area where the owner’s small daughter stared and laughed at the foreigners sitting at her table. Sometime during the early evening as I sat drinking tea, attempting to stay warm from the yak dung stove, I dropped into a gentle trance listening to the wind. The whole world was gone for a moment and all my senses focused on its calming song.